Have you been looking for linen upholstery fabric at great price in the UK in order to achieve a new look for your old and tired sofa? If you can’t quite decide what kind of fabric you should choose for your upholstery project – we recommend that you consider a natural pure linen fabric. Linen fabric feels better to the touch and lasts up to twenty years without wearing down. Linen is a luxurious alternative for upholstery as well! Quite often people first think of polyester and other artificially produced fibres. Cotton and linen upholstery fabrics provide a good and more natural alternative. They are hardwearing so they can be used for upholstery, even with the optional fire retardant interlining, in order to make your furniture safe. Natural linen looks gorgeous on sofas and arm chairs – you can easily combine other fabrics with it. It goes with various colours. If you are looking for linen upholstery material we have several alternatives for you. 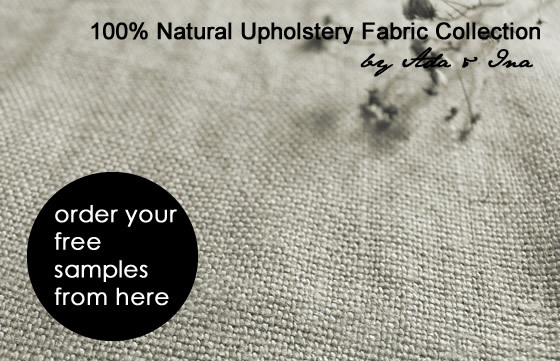 One of our most recommended fabric for upholstery is 100% linen Ebba fabric. It comes in two colours Natural and White. Ebba is a great fabric to work with and it feels lovely on the skin. Natural linen fabric is much more ecological alternative than manmade fibres for upholstery textiles. Browse Ada&Ina's Upholstery Fabrics Collection online. Read more about our Linen fabrics.